Dragon Ball FighterZ has quickly grown from a "huh, that looks neat"-level game for fans of the long-running anime to a fighting game so highly anticipated that the scheduled beta practically melted Bandai Namco's servers and the publisher scrambled to squeeze in an extra day to make up for lost time. And, it turns out, that extra day is... today. Late last night, the Bandai Namco Twitter account announced that an extra day for open beta testing would commence on January 17 (that's today) at 9pm Pacific / January 18 at 5am GMT. This second round will last 24 hours, and then - presumably - that's all the 2D DBZ fighting action you'll get until the Dragon Ball FighterZ release date of January 26. The previous beta let players fight as Android 18, Beerus, Cell, Frieza, Gohan, Goku, Kid Buu, Krillin, Nappa, Piccolo, and Vegeta. Bandai Namco hasn't confirmed if this same roster will be the one available starting tonight, but I'd expect so. On the plus side, Bandai Namco did confirm in a new issue of Japanese magazine V-Jump that Android 21 will be playable in the full game. 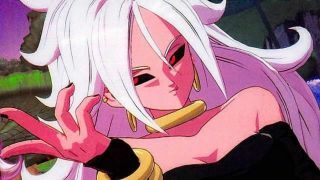 Positioned as the game's story mode villain, Android 21 starts as a slim, human-looking woman with brown hair and glasses. When she transforms and enters combat, her skin turns pink, her hair white, her eyes red, and she sprouts a tail. She also wears clothing similar to that of Majin Buu, though why these visual changes occur is still unknown. I suggest you gather your ki and practice your best Goku scream, then be sure to hop online for one more chance to play Dragon Ball FighterZ before it's out.